The Broomhill Sands Coastal Defence Scheme has been shortlisted in two categories of the 2016 British Construction Industry (BCI) Awards. The BCI Awards recognise and reward excellence in project delivery and are the only construction industry awards scheme to have the backing of the Prime Minister. With a panel of exceptional judges, site visits to all shortlisted projects and rigorous interviews for all shortlisted companies, the BCI Awards are the ultimate vindication of project team success. Delivered by Team Van Oord and on behalf of the Environment Agency, Broomhill Sands is shortlisted in two BCI Awards’ categories – Civil Engineering Project of the Year (£10 to £50m) and Best Practice in Procurement. The £30m scheme, which took two years to complete, will provide improved protection from flooding for around 1,400 homes and 100 businesses along a 2.5km stretch of the East Sussex coastline from The Suttons to Lydd Ranges. The scheme has increased the standard of protection to the area from 1 in 20 years to 1 in 200 years. This means that the risk of flooding in any one year has reduced from 5% to 0.5%. 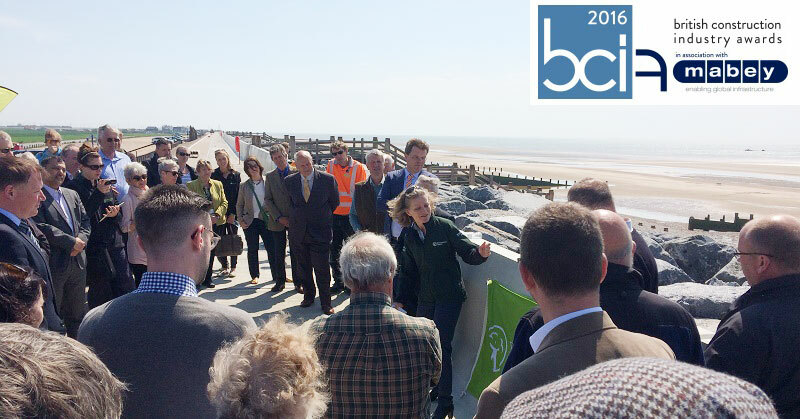 Broomhill Sands was officially opened earlier this month by Emma Howard Boyd, Chair of the Environment Agency(pic above). The BCI Awards judges will visit Broomhall Sands on 20 June, and the 2016 Awards will be presented on 12 October at the Grosvenor House Hotel in London. The Broomhill scheme is no stranger to success, having been cited in a string of industry awards schemes. This year it has been named a finalist in the 2016 Constructing Excellence Awards and the ICE South East England Engineering Excellence Awards 2016, which will be presented in June and July respectively. Earlier this year it received the Innovation Award at the 2016 Environment Agency Project Excellence Awards, and last year the scheme was the recipient of the Environment Agency Exemplar Award which is presented annually to recognise outstanding health, safety and environmental performance. The Environment Agency and Team Van Oord enjoyed unparalleled success two years ago at the 2014 BCI Awards. The partners received two awards, including the top award of the night, The Prime Minister’s Better Public Building Award, which is sponsored by The Cabinet Office. The other win was the Civil Engineering Project of the Year (£10m to £50m) Award. Both awards were for the Medmerry Managed Realignment Scheme in West Sussex which was commissioned by the Environment Agency, with Team Van Oord as principal contractor.